Fallingwater was voted the best American building of the last 125 years by the American Institute of Architects, and is visited by more than 75,000 people each year. 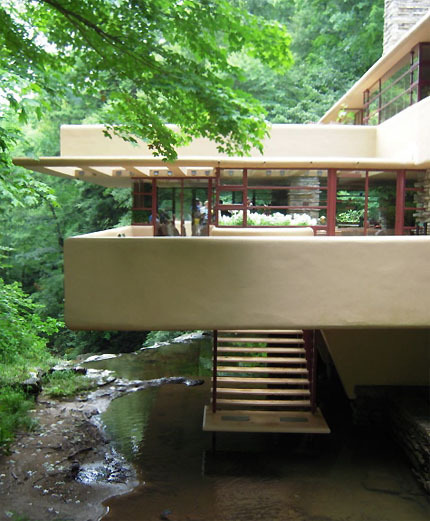 Cantilevered out over a waterfall in rhodondendron woods about two hours east of Pittsburgh, it was built as a weekend home for Edgar J. Kaufmann, who made his money through the (still existing) Kaufmann department store in Pittsburgh. 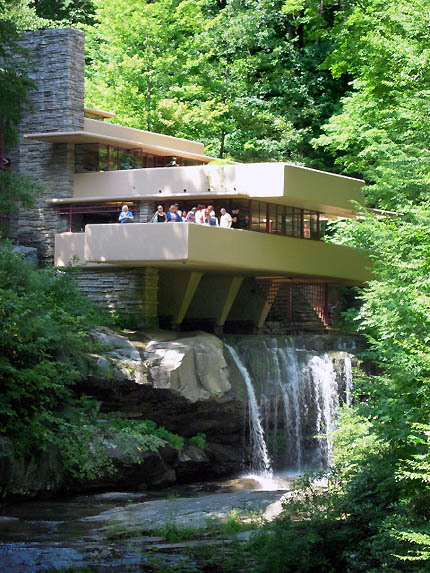 Fallingwater dramatically combines Wright's vision of 'organic' architecture with his engineering skills in cantilevering. Wright's choice of the building's position within the site, and design of the overhanging building, allow the inhabitants to 'live with the waterfall', rather than simply look at it. To achieve this result the house is constructed of cantilevered planes, built in reinforced concrete. The planes are anchored into the rock of the hillside and pinned down by the massive stone chimney and walls at the back of the house. A light curtain of glazing divides the planes between spacious interior living spaces and outside balconies. 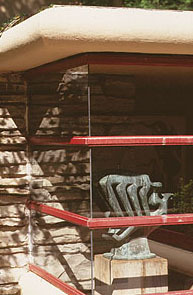 Wright exploits the lack of need for structural support in the glazed walls by omitting even a glazing bar in the corners of the windows (see pictures below), emphasizing the continuity between the inside of the house and the woods around. Inside, the main living floor is a large, continuous space, an extraordinarily impressive room with defined entry, living and dining areas. Upstairs are small but well-lit bedrooms opening onto another layer of balconies. The interior of the house remains just as the Kaufmanns lived in it, with furniture that Wright designed for the house mixed often incongruously with other pieces the Kaufmanns bought themselves. The story of Fallingwater (as told exhaustively by the tour guides) is a story of the strong wills of both architect and client, whose obvious respect for each other is matched only by each man's expectation of getting his own way. The result is a stunning house, both in its overall form and the details of shelving, glazing, fixtures and furniture in each room. It is simply well worth traveling across the world to see. 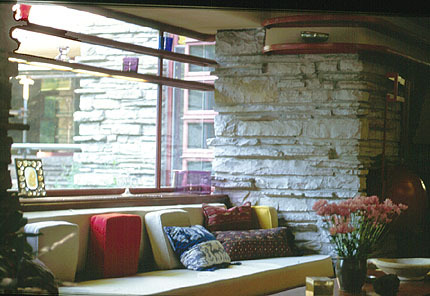 Fallingwater is open to the public and well managed by the Western Pennsylvania Conservancy Trust, to whom Edgar Kaufmann, Jr donated the estate. Visiting is only possible through the Trust's tours, which are informative and well run (but be prepared to learn as much about the Kaufmann family and the Trust itself as about the house). The Trust provides both generalist and in-depth tours. You must reserve a space at a particular time in advance, online or by telephone. The in-depth tours give you more time in each room, the opportunity to see the house with fewer people at one time, access to smaller spaces the generalist tours don't cover (particularly the kitchen and basement) and the opportunity to take photographs inside the house (which the generalist tours don't allow). Children below the age of nine are not allowed in the house itself except on separate children's tours, but the Trust runs a very good child care center for them at the house's visitor center. You should book a space when you book your tour. 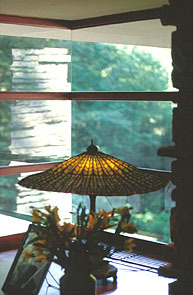 For visiting details, directions and to book your tour, please visit www.fallingwater.org or call +1 724 329 8501. Fallingwater is on SR 381 midway between Mill Run and Ohiopile, about 2-3 hours' drive from Pittsburgh. Local signposting for the site is good once you get within a few miles. The house is not visible from the road or even from the visitor center, so you will not get to see anything unless you book in on a tour. While in the area you may want to visit Kentuck Knob, a more recent Frank Lloyd Wright house that is also open to the public and is only a few miles from Fallingwater. Grand coffee-table book by the late owner of the house, with fantastic color photographs but architecture-free text. Accessible and well illustrated account of the house. A practical visitors' guide to thirty six publicly accessible Frank Lloyd Wright sites, with a straightforward one or two page description of each, with black and white photographs.